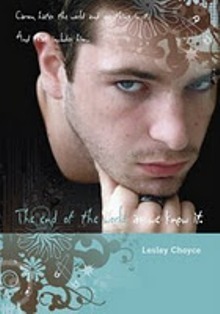 This young adult novel by Nova Scotia author Lesley Choyce tells the story of sixteen year old Carson, attending a last-resort private school for kids who have flunked out elsewhere and hating the world. His life changes when he meets Christine, a teen whose circumstances are much worse than his but who teaches him to find happiness in his imperfect life. Carson hates the world and everything in it. Because of his clear disdain for humanity, Carson often finds himself in conflict with his parents, teachers, and peers. Consequently, Carson was kicked out of his public school, and now attends Farnsworth Academy, a school for wealthy kids with behavioural problems. Though Carson continues to be depressed throughout his tenure at Flunk Out Academy, things change when he meets a local girl named Christine. Christine’s parents abandoned her, and she now lives alone in an old trailer, in constant fear that social services will find her. Because of her living situation, Christine is severely depressed, and in the past has resorted to self-mutilation as a means of coping with her problems. Christine’s desperation shows Carson that his anger is not a product of tangible problems, but is, instead, an emotional response to his philosophical reflections about humanity. As Carson begins to develop feelings for Christine, he also begins to open himself up to his teachers, his family, and his roommate, Fin. However, just as the future looks brighter for Carson, Farnsworth Academy is shut down. Feeling lost, Carson and Christine decide to take it upon themselves to find a new place to live and call home. The End of the World as We Know It is a young adult realist novel, and is told from a first-person, immediate-engaging perspective. Wealth, Privilege, and Rebellion: Carson comes from a wealthy, loving family, and his parents have done their best to ensure that their son is well-adjusted, educated, and happy. Despite his parents' best efforts, however, Carson is angry, anti-social and depressed. He refers to the cause of his depression as his “intellectual awakening,” in which he learned “how to see things as they really are” (13). Carson's emotional state is a product of his appetite for knowledge, in particular, his interest in the history of human civilization. However, a consequence of focusing his interests on human conquest and warfare is that Carson becomes increasingly pessimistic about humanity. For Carson, Christine is a symbol of humanity’s biggest problems. Poor, abused, and full of self-loathing, Christine epitomizes Carson’s opinion of humanity, and he is drawn to her, not because she contrasts his negative world-view, but because she embodies it. However, by realizing he has developed loving feelings for Christine, Carson discovers that even in the darkest moments of life, there are positive ones. Reviews: Canadian Materials 14. 3 (2007): Web.